Gel Spun Polyethylene (GSP) fishing lines get their strength from the weaving or laminating of many polyethylene fibres. True braids, as their name suggests, achieve this by ‘braiding’ fibres together while fused braids use a proprietary form of ‘heat welding’ the fibres together. Fused GSP lines are generally cheaper, stiffer and thicker than braid of the same breaking strain. This doesn’t mean it isn’t as good. Particularly in very light breaking strains it can be much easier to handle than the wispy fine braided lines of the same strength. Also while they still share the same virtual ‘no-stretch’ sensitivity of braided lines, their lower cost makes them a great starting point. Fused braid (e.g. Berkley Fireline) has been around for long time now and much has been written about how to use it. My first experiences with fused braid were around 2001 when I purchased a spool of 3.6 kilogram Smoke Fireline from the USA. Originally drawn to it because of the thinness, strength and claims of zero stretch and increased casting distance it seemed to be ideal for spin fishing. However, it would be fair to say that my first attempts at using the Fireline Smoke variant were disappointing. Out of the packet it was a charcoal grey colour and seemed to have a glossy waxy coating on it. It laid nicely on the spool but I encountered several problems which eventually put me off using it. These problems were the propensity to form wind knots, the difficulty in seeing the braid in the half light and the apparent fraying of the braid (furry filaments that appear on the surface) which seemed to happen within a couple of hours of use. After a few sessions I gave up and reverted to nylon. Never overfill the spool. It is best to leave at least a 3 mm gap from the spool lip when filling it initially. Braid is so much thinner than nylon that casting distance is not affected by under filling the spool slightly. If the spool is too full it allows loose loops to form during casting and these are what form knots. Fill the spool initially under pressure. I run the braid through a piece of damp cloth and pinch it firmly. There should be enough pressure on the line to make the handle slightly difficult to turn with a working drag set on the spool. This ensures that the spool is filled evenly and this is really important as with braid any loose line will cause wind knots. After casting, glance at the reel for loose line or loops over the edge of the spool before you engage the bale arm. Flick the bail arm over manually rather than by turning the handle and using the automatic bale trip mechanism. This ensures that your hand is in the ideal position to give the line a tug to tension it and remove any overlapping loops before you begin the retrieve. While this may initially seem a bit tedious it soon becomes automatic and a seamless process. Avoid slack line retrieves. This is generally not an issue if you are retrieving heavy hard bodied lures under constant tension. However, if you are retrieving soft plastics, especially on a windy day, and the jig head is too light then the wrist flick action used to impart movement to the lure can create slack line. My recommendation for soft plastics is to try to minimise the bow in the braid caused by the wind by increasing the jig head weight and lowering the rod tip. If you can’t do this then reduce the amount of wrist flick and use a more steady, measured retrieve to keep the line tight. One of the other problems commonly encountered, especially when fishing with braids of a breaking strain less than 5 kilograms and a monofilament trace of 7 kilograms, is braid breakage in the short section of line above the leader where the line folds downwards at the rod tip prior to casting. This failure seems to happen after about 1.5 hours of continuous casting. I’m not sure what causes the breakage but I have a feeling that it is due to the continual stress placed on that short section of line from repeated casting. 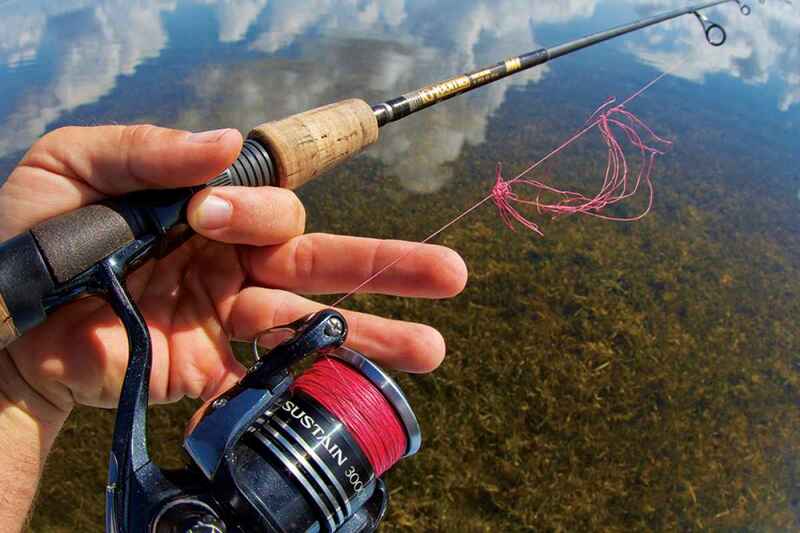 To avoid it routinely re-tie on traces every hour when fishing with light lines. It does not appear to be a problem with fused braids having a breaking strain greater than 5 kilograms. I would also recommend always making sure that the knot joining the trace and braid is outside of the rod tip when casting. 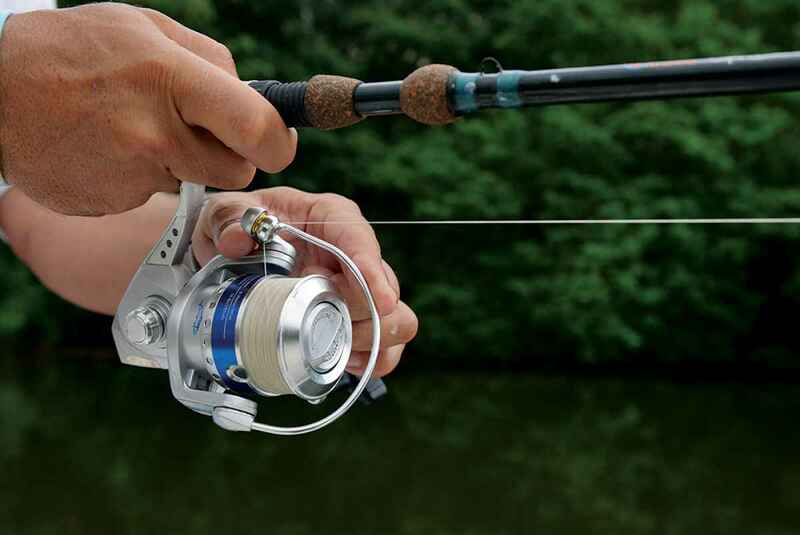 If the knot is inside the guides then it can catch and either damage the guides or potentially break the rod, especially if it is a two piece rod. This has happened to me even with a smooth, coated knot. 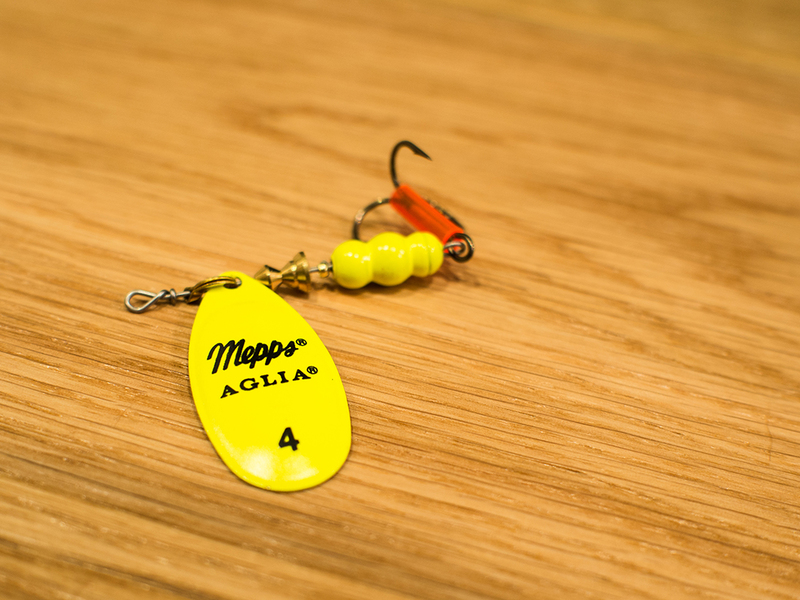 The knot catches, the tip section flings off during the cast and inevitably ends up hitting the water tip first. Before tying the knot I like to draw the braid between my thumb nail and forefinger under tension to soften the braid. This seem to make the knot draw together more evenly and prevents overlapping. Other reliable knots to use for attaching traces are the Albright and FG knot. One of the interesting things that I have also discovered about fused braid is that it is not as likely to twist as monofilament when using bladed spinners (Mepps style) or Devon minnows. These lure types are very effective in fresh and salt water and largely fell out of favour due to problems with line twist. 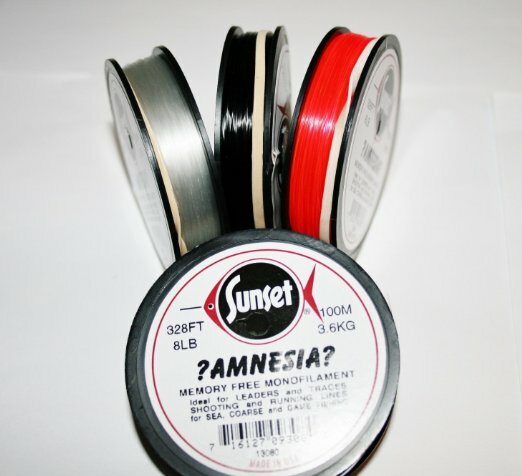 I’ve attached Veltic 5 lures to the Amnesia trace without a swivel and spun for over one hour and not experienced any line twist issues. The braid does seem to twist but it does not appear to form loops as monofilament does. I still tend to use a swivel when using Devon minnows and this seems to avoid any appreciable twist. This is one of the less reported advantages of fused braid as these lure tyes do not seem to be used as widely as they once were. Another thing to be aware of is that you tend to lose more fish with fused braid close to the shore due to the reduced stretch. It is very important not to go too hard with fish that have soft mouths or a tendency to jump (trevally and kahawai respectively), especially near the end of the fight, as the hooks will either pull out or bend. Either way the fish is able to escape. It is not so much an issue when there is a lot of line out just when the fish is close to the shore. Be prepared to drop the rod tip and point it at the fish when it makes a run or jump in the shallows to counteract this. There have been many developments in other fused braid over the past few years and they are now uniformly thinner (e.g. Nanofil) and less prone to surface fraying. Most of the fraying that occurs with modern braid is where the line is held on the finger tip during the cast or in the heavy wear area above the trace knot mentioned earlier. I tend to cut this off at the end of every session and re-tie the knots to avoid any chance of failure. The other thing worth doing at the end of every season is remove and reverse the braid on the spool. This means that the largely unused braid from the base of the spool is brought to the surface which effectively doubles the working life. Braid will last several seasons if it is cared for and reversed in this manner. I always attach 20 – 30 meters of nylon to the spool and attach the braid to this when spooling as it stops the braid from spinning around the arbour, especially under heavy load. There is no doubt that fused braid is an amazing product. The increased casting distance and instant contact with anything on the other end of the line due to the low stretch make it possible to hook more fish, especially at long range.